WATERLOO, ON – President’s Choice, the house brand at Loblaw’s grocery stores and their subsidiaries, has added a new brand to the line-up of discount beers brewed for them by Waterloo’s Brick Brewing. PC Cerveza Mexican Inspired Beer is easy-drinking, smooth and light-bodied – pair it with spicy foods to help cool your palate or enjoy as the ultimate thirst quencher on a hot day. For some extra refreshment, serve with a wedge of lime in the neck of the bottle. 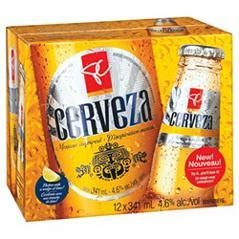 PC Cerveza is available now at Beer Store outlets throughout Ontario, and at Loblaw-owned groceries in Quebec. I love this Cerveza beer. I started drinking beer because I liked the taste of Corona. Your beer is very similar in taste but at a reasonable price. If you keep it at reasonable price it really represents great value. Corona is history. I love Mexican beer, especially Corona. Thought PC Cerveza is similar but it isn’t. That’s probably because PC Cerveza comes from the same brewery than Laker’s. I would say PC Cerveza is actually quite similar to Laker’s. Light: yes. Drinkable: yes. Corona-like: no. I love this beer but every time I go to the beer store either they have only 1 case or none in stock and this is week after week , so I asked when their beer shipment comes in I went the very next day asked for a case and voila I again purchased the last case, that was today then I’m told another shipment will not be in for the week, what is going on here, I talk up this beer but you cannot buy it at the beer store they seem to only get 1-2 cases in a week and ALL3 beer stores are sold out by mid week, why would be the question? I know it’s good beer but sold out every time!